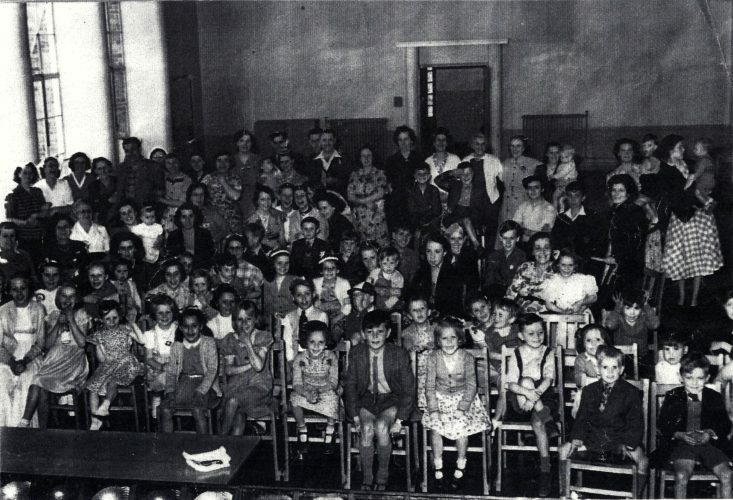 This is a picture of an event held at the school during the 1950s. At the back of the hall, the door to the foyer is open; the flower arrangement on the polished table being just visible. The closed doors on the left led into the dining room. Taken from a photograph in Robin Safe's possession. Robin Safe, who attended St. Martin’s Junior School in the 1950s, has this photograph of an event held during the period. It is evident that the photograph was taken in the hall and parents were invited as well as children but, unfortunately, Robin and I cannot remember the occasion. Therefore, we would both be grateful if someone could enlighten us! Robin is sitting at the front of the photograph and I might be one of the girls sitting further back!